Flying Carpet Theatre continues our collaboration with Writer/Performer/Activist Shontina Vernon with a mashup of autobiographical storytelling with a hip-swinging Rhythm & Blues concert. On May 1–5, Vernon and FCT will begin the next stage of workshops for Shontina Vernon: Forging Ahead in New York City. Shontina Vernon is one of several artists building one-person shows with FCT. A look into Vernon’s extraordinary life, Forging Ahead charts her personal upheavals and R&B’s role in granting her solace, escape, and community. Vernon depicts her past including her upbringing by rural grandparents in Lameesa, Texas, assuming control of the family finances at nine-years old, and forging of $400 worth of checks shortly thereafter. Upon discovery of her crime, 10-year old Vernon was called a “pressing threat to the Lameesa community” by the local district attorney and placed in a juvenile detention center for a year. With the advocacy of a stepsister, she got out of juvie only to be placed in the care of abusive relatives. The ongoing trauma of having been jailed plus enduring family abuse led Vernon to forge fake identities to survive. Through most of high-school, she presented herself as affluent, with a close-knit family that mirrored TV’s Huxtables. Vernon pairs each chapter of her story with a classic R&B song enriching the experience of her tale. As a performer, she ekes humor out of her situation and the characters in her past, resulting in a show that is touching and surprisingly funny. Vernon builds to finding her own authentic voice as an R&B singer, culminating in two final original songs that she wrote. We’re excited for the opportunity to develop this work by performing for students. Many of the students Flying Carpet has performed for over the years describe the impact of having family in the justice system. Research into the U.S. incarceration indicates that black girls face particular challenges. As K. Crenshaw highlights in her recent, Black Girls Matter: Pushed Out, Over-policed and Unprotected, females of color are the fastest growing prison population. With Forging Ahead, FCT aims to challenge clichéd representations and present what happens in the aftermath of juvenile incarceration. Vernon’s work intersects of art, music and activism. In 2016, she was awarded the Robert Rauschenberg “Artist as Activist” Fellowship. 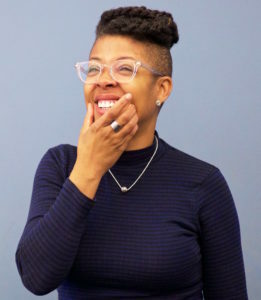 As a writer, her work has been produced by Seattle’s ACT Theatre, the Hansberry Project, and developed at New York Theatre Workshop. As an actor she’s had major roles in television shows including E.R. and 24.